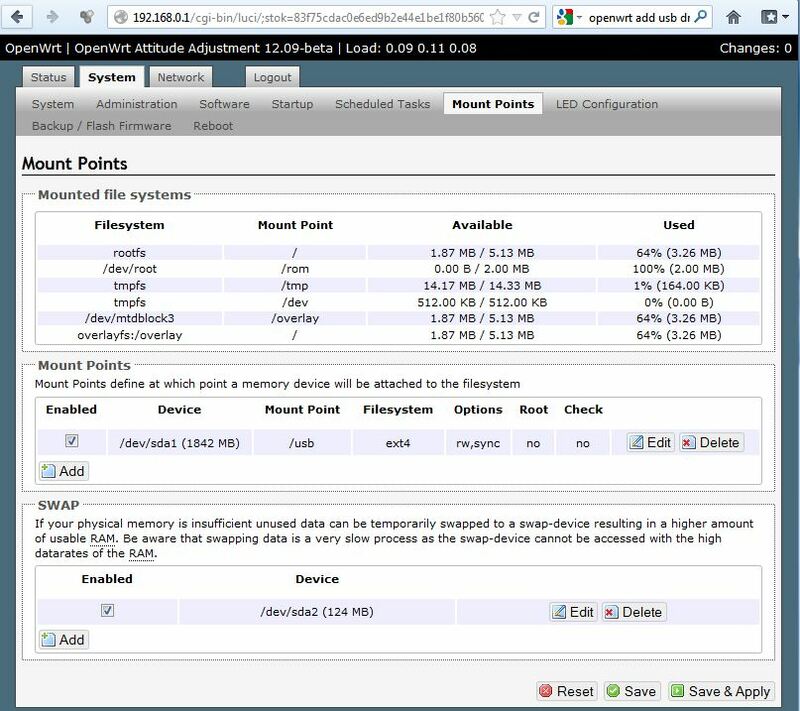 This entry was posted in Linux, Networking and tagged cups, openwrt, wr1043nd by Matt. Bookmark the permalink. Thanks very much. I’ve tried that on Backfire box and it works. Especially that chmod part was what I missed. I have HP printer so I installed also hplip, so I chmoded backend/hp instead of usb. Since then Find new printer worked but only raw queue seems to work but haven’t tried a lot. Glad to hear that was of help! Yeah I possibly could have mentioned something about HP printers, but not having one I didn’t have to do any config regarding it. In terms of only raw queue working, have you tried installing PPD files for your printers? To be honest, I’m not sure if that was needed, but I did it anyway for both my printers. The other thing to mention, have you got the windows/mac drivers (depending on your OS)? On each machine, I installed the network printers with the actual drivers, rather than RAW. Works for me on all the devices I’ve tried. I guess it’s a matter of potentially finding the drivers though. Next step for me is to try get scanning working (using SANE). There is no problem to have the printer as RAW queue (precisely “Driver: Local Raw Printer (grayscale)”). We have also Windows PC. So the printer is added to Linux/Win systems by URL with appropriate drivers from system. It seems to me as best possible option. I’d like to have SANE working too, but there is even less resources of information then these about CUPS. You will hear from me as soon as I discover something. Hi again, yesterday I have made SANE working. I think main problem is to have propper backend such as hp.conf or any else in /etc/sane.d/. I wrote down what I did, maybe something help you, but I did everything what I have found and I don’t know whether everything written is required or something still missing. Hey sorry about the late reply. I appreciate the comment and it’s fantastic you’ve written a guide. I still intend on looking into this. Just haven’t found the time to try it out myself. thanks for the howto. It worked for me but my TP-link needed some tweaking because it needs to upload fimrware to my HP laserjet P1005. Maybe you can add the following to your HowTo? The above installation worked well but when I wanted to print something, nothing happens. There is a job in the job que and it also calls it finished. This is because the printer needs firmware uploaded via USB to function properly. Download the appropriate firmware for your HP laserjet from: http://oleg.wl500g.info/hplj/ and put it in /usr/lib. Where “usb://HP/HP%20LaserJet%20P1005?serial=BB0417Y” needs to be replaced with yours. You can find it by using the /usr/lib/cups/backend/usb command. The next thing to do is to create some hotplug script to upload the firmware each time the printer turns on. I will put it here when I have a working hotplug script. logger -t HotplugScript Activating HP LaserJet FW upload script….. Cheers. I’m sure this will help someone. Just added a link to the comment on the OpenWrt CUPs wiki page. the problem is solved. You have to activate the online print support under Win7. Having issues getting my printer listed when running this command. Any advice? I’m currently overseas and not really able to offer that much advice. – Reread the stuff above that point in the guide. 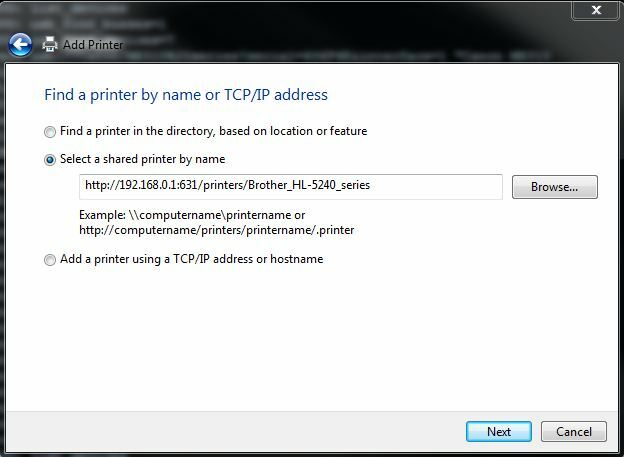 – Are you able to try another printer and see if it detects it? – could also be your version of openwrt. As above I had issues with certain versions. – if you are using a USB hub make sure it’s a powered one. – you haven’t tried installing p910nd or something else that attempts to take control of printers or USB devices? If so, personally a re install of openwrt might be the best option. If nothing above is helpful, more info about your set up would be e.g. devices you’re using and connecting, version of openwrt etc. I followed your great guide. I’m stuck however with one problem. Printing txt files, printer self-test pages or webpages from chrome is no problem. When I try to print a docx or pdf file, I does not work. I already increased CUPS cache but that didn’t help. Hmmm. I wonder if its worth trying to find some different drivers for your printer? My understanding of printers is you have two types of drivers, postscript and PCL. I forget which does what, but from memory one simply sends the file straight to the printer and the printer does the processing, and the other processes the file on the computer first before sending to the printer. I could be talking rubbish here but it could be worth looking into. I presume 192.168.1.1 is in fact the IP address of your OpenWRT device? Are you sure you followed Step 3 onwards correctly? 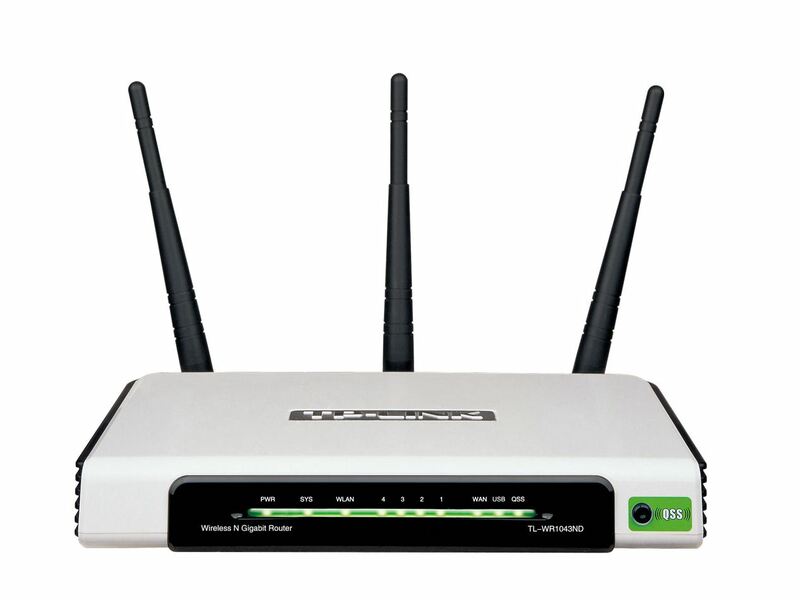 you need to make sure your wireless routers IP subnet is permitted. I have the same problem but in my case cupsd will not even start. Do you have any idea where to look into why cups is not starting? Since there is no cupsd process, the admin panel is unavailable. I’m really not too sure sorry. I wonder if cups initially installed properly. I also wonder if the current cups version in the repo is compatible with all versions of OpenWRT. I don’t actually use Cups anymore, as I now just have 2 network printers, so my knowledge of cups and openwrt isn’t as good as it was 2 years ago when I did this. If you do manage to figure it out, I’d suggest following up to your comment, in case someone does a google with the same problem. i runs 3 printers on my router, and it all worked. When I configured my laptop to add printer, one of the printer (hp deskjet 3900) wasn’t listet in add printer wizard. So But, when I used other laptop, the printer was listed. would u like to explain me this case? I assume you mean when you’re trying to add the printer on your PC. In other words, the printer shows up within CUPs. Are you sure you did Step 5 above correctly? If the issue is something more than this, I’m not sure if I can help. I now only have network printers, and don’t use CUPs or OpenWRT anymore. Okay Matt, Finally I add the printer by took the driver printer i had download and it worked. Just setup Brother HL-1110 following your instructions without ppd. Tried using p910nd but failed. I am a first time openwrt user, thanks so much. Openwrt is installed on Planex MZK-W04NU. I followed this guide but with a HP Photosmart 7350 and it works perfectly fine in Windows for printing but in Linux it prints a line of random characters and spits out the paper. It continues to do this until I cancel job. I specifically use Mint 17.1. To me this sounds driver related. I would be googling for similar issues with using printers on linux. Hey thanks for your feedback Markus! I understand the Idea to reinstall from scratch, nut I got lots of thing runing on the machine. Could you please give me an idea? Thank you for the paper you made and hope you could help! I have to admit, it’s been a couple years since I last looked at OpenWRT stuff, in which case I’d suggest making a post on the OpenWRT forums also. – Reread all the steps up until “root@OpenWrt:/# /usr/lib/cups/backend/usb”. I say this, because there is a lot there in the guide, and it could just be one little step missing which is causing the printer not to be observed by CUPs. You could try “lsmod /usr/lib/cups/backend/usb” just to confirm the file *does* have the right permissions. Also check the processes running on the system, just to make sure that there isn’t something from the previous p910nd installation causing issues. I assume at some point during all of this, you’ve also rebooted your Router. Make sure you’ve got all the right modules/sevices installed also, like hotplug etc..
As one side suggestion – If possible, try another printer. See if another one is detected, just to confirm whether there may be issues with it detecting your printer. I can’t even get past the first step. When I attempt opkg update opkg install cups, I get ‘unknown package ‘cups”. Can’t find anything on this problem. If not-let’s compile it from source? By the way. there was a problem with openwrt server and to work on 14.04 you will need to change the opkg.conf file (see the oficial forum) i think that they will solve the problem soon. Excellent tutorial though, thanks again. Thanks it worked great on GL.iNet travel routers which run a version of openwrt. I not sure which part fixed my issue. It was showing me the printer when I used /usr/lib/cups/backend/usb but it wouldn’t show up in the web interface but it works now. Yeah I remember when I initially set this up years ago I had a number of issues getting it to show up in the web interface. It was possibly permissions related at the time. i followed your tutorial. 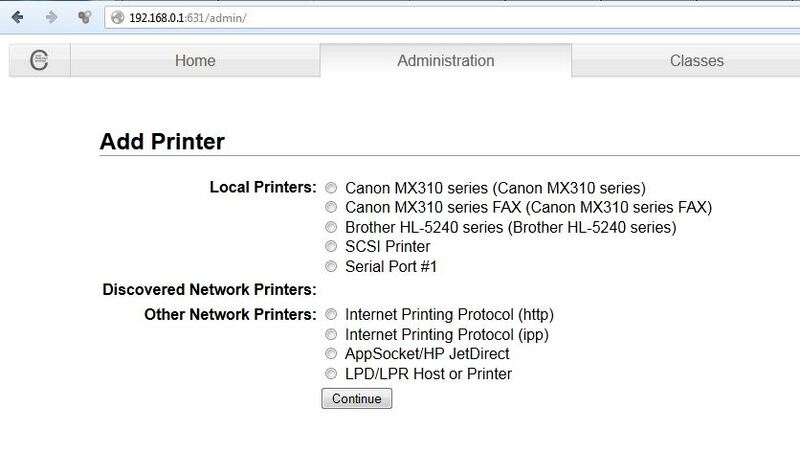 My printer is Canon LPB 2900 and it is sucessfully detected in CUPs page and i added the printer. when i try to give the print from Windows 7 pc it says” Print server error” Print server down. Please help me sir.